Taylor Bakogeorge with a hat-trick was joined on the Town scoresheet by a brace from Courtney Boughton plus single strikes from Perry Ronayne, Colby Smith and Tim Clarke against United replies via Aran Hazelwood, Serge Kardji and Mark Reed. For second place Wilstead it was a 5-0 home win over Ickwell & Old Warden. Paul Jones with a hat-trick and Luke Pursey with a brace brought up the nap hand. Whilst third place Caldecote also won big with a 6-1 victory at bottom of the table Sandy, Nicky Albone and Jack Boyd with braces joined on the Caldecote scoresheet by Jake and Tom Wallace against a lone home reply via Simon Desborough. Now in fourth are AFC Oakley M&DH who returned to winning ways on the road, 2-0 at Sharnbrook. Headed goals in the second half from Reuben Joseph-Hukin and Nathan Aulsberry did the damage. Whilst Flitwick Town dropped down the table from third spot to fifth spot after losing their seasons 100% home record when beaten 3-1 by a Marston Shelton Rovers side collecting their first away points of the season. Rovers took a seventh minute lead when Lewis Cerminara netted a free kick from distance before they doubled their advantage just two minutes later via Dale Malciw. Town however were back in the game after Phillip Matthews netted in the 23rd minute until a successfully converted penalty 13 minutes from time by Dylan Porter sealed the full three points for the Rovers. There was continued home success for now seventh Shefford Town & Campton who retained their unbeaten home record with a 4-1 victory over Kempston Rovers Development, Louis Taylor netting three times and Jake Renney once against a lone Rovers reply via Patrick Asare. Elsewhere the remaining two games were both to go the way of the visitors. A lone goal from Keiran Souter took Stevington to a 1-0 victory at Cranfield United. Whilst Ampthill Town Reserves were the 2-1 winners at Wootton Blue Cross to claim their first away win of the season, Curtis Stirling and Scott Gadsden netting the vital goals against a lone home reply from Lui Sarrington. We now have new leaders of the Division One supported by Wests Citroen Bedford in the shape of Queens Park Crescents who made it seven wins on the bounce to retain their unbeaten ways with a 5-1 victory at M&DH Clapham Sports. The hosts were losing for the first time in eight outings and the first time on home soil this season. Shahiaur Rahman with a hat-trick and Daniel Rasol with a brace brought up the Crescents’ nap hand against a lone home reply from Liam Bolton. Meltis Albion lose out on that top spot after they were beaten 4-1 at Crawley Green Reserves who duly retained their own unbeaten ways to climb up into second, just a point behind the Crescents and now one point ahead of the Albion. Valentino Qoku, Tom Barnett, George Hewitt plus a penalty from Robert Newman made up the Green scoresheet against a lone Albion reply via Gary Townsend. For fourth place Westoning it was a 4-1 home defeat against Henlow who now climb up into fifth. Luke Hills and Paul Wright both scored twice for the visitors to take them to just their second away win of the season against a lone home reply from Lewis Wilson. Whilst now back in the top six are Totternhoe Reserves who won 4-0 at The 61FC Luton Reserves. Joe Smith with a brace was joined on the scoresheet by Tom Howson and Dan Woosley. Elsewhere the remaining two games both went the way of the visitors. A lone goal from Josh Goor took Shefford Town & Campton Reserves to a 1-0 victory at AFC Kempston Town & Bedford College Reserves. Whilst Cople & Bedford SA claimed their first away win of the season with a 4-1 victory at Elstow Abbey, Ollie Hughes netting twice to go alongside single strikes from Tom Marwood and James Munns against a lone Abbey reply via Lucas Banton. Wixams are now back onto the top of the Division Two table after they ran out 5-1 winners at Potton Town. 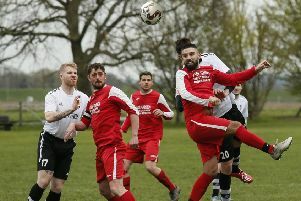 Gareth White scored four times and Charlie Battams once to do the damage to leapfrog them above the start of play leaders Riseley Sports who were held to a 0-0 home draw by Houghton Athletic. For third place Cranfield United Reserves it was a 3-1 away victory at AFC Oakley M&DH Reserves who are still in search of their first home win of the season. David Adderson, Joe Sames and Adam Kerr netted the United goals against one in reply from Matthew Bruney. Whilst claiming their first away victory of the season to move up into fourth spot were Atletico Europa who won 2-0 at Caldecote Reserves thanks to a brace of goals from Mo Banda. Wilstead Reserves find themselves four points clear after they took their unbeaten ways up to seven games when winning 5-2 at Shefford Town & Campton A. Robert Booth led the way with a hat-trick and was joined on their scoresheet by Shaun Winconek and Alex Russell to bring up the nap hand against a home brace in reply from Liam Radley. Whilst now in second are Renhold United Reserves who also took their unbeaten sequence up to seven games with a 8-0 home win over Sandy Albion, Nathan France netting five times and Michael France three times. United clambered above Kempston Athletic who were beaten 7-4 at White Eagles, Arkadusz Boruch netting four times plus an own goal and strikes from Michal Michalski and Wojciech Pitzga marking the Eagles scoresheet against Athletic replies via an hat-trick for Gary Whitbread and a single strike from Josh St Clair Pierre. Now in fourth spot are Caldecote A who won 5-1 at Wootton Village. Dan Kingdon with a brace was joined on the scoresheet by single strikes from Tony Norman, Neil Giles and Chris Foster to bring up the nap hand against a lone Village reply from Jason Churchman-Hall. Elsewhere fifth place Marston Shelton Rovers Reserves were beaten 2-1 at home by Bedford Albion who are now just a single point behind them in sixth spot having also played two games fewer. Paul Babbington and Shane Canzano netted for the Albion against a lone Rovers reply via Keiran Day. CS Rovers’ lead in Division Four is up to three points despite them being held to a 2-2 home draw by Harlington. Ruairi Griffin and Lorrell Smith scored the Rovers goals against replies via Ben Whalley plus an own goal. Their lead at the top increased after second place Henlow Reserves saw their unbeaten away run and five game winning sequence come to an end when beaten 4-3 at AFC Kempston Town & Bedford College A who are now unbeaten in their last four starts. Giovanni Moscaritolo with a brace plus John Hislop and Farid Mirazi were on the Town scoresheet against Henlow replies via James Campbell twice and James Davies once. However, closing the gap on the top two were Clifton who took their unbeaten ways up to five games with a 1-0 home win over bottom of the table Lidlington United Sports thanks to a lone goal from George McMillan. Whilst there was wins on the road for Sandy Reserves and Stevington Reserves. Sandy winning 2-0 at Flitwick Town A thanks to a goal from James Presland plus a successful penalty from Aiden London just two minutes from time. Whilst Stevington Reserves were the 4-1 winners across the road at Dinamo Flitwick, Jamie Endersby with a brace plus strikes from Martin Williams and Martin O’Rielly only once being replied by Dinamo’s Dale Goldie.